Are you interested in participating in an in-depth study of the principles and promises of Step 12? If so, please join us as we read and discuss the AA Big Book chapters 8 – 11: For Wives through to A Vision for You, page 164. Sundays: 5:30 to 6:30 A.M. Please share this information with others and help carry the message. 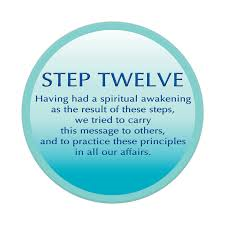 Looking forward to sharing this journey through Step 12 with everyone.